Bill Cowher reached the pinnacle of his sport by leading the Pittsburgh Steelers to a Super Bowl victory. But through all his years on NFL sidelines, he never forgot about another sport he loved. Cowher grew up in Pittsburgh as a fan of the AHL's Pittsburgh Hornets, the city's predecessor to the Penguins. His appreciation for hockey only grew when he was hired as the Steelers' coach in 1992 -- the same time another iconic Pittsburgher was cementing his own status within the city's sporting hierarchy. "I knew Mario [Lemieux] and all those guys. I knew them very well," Cowher told NHL.com before his appearance on Cisco NHL Live to discuss MelanomaExposed.com, a website aimed at raising awareness about skin cancer. "Howard Baldwin was the owner back then and [Jaromir] Jagr came on the scene and they were a very talented team." As he turned the Steelers into a consistent Super Bowl contender, the man who used to play ball hockey around town as a boy became an integral member of Pittsburgh's sporting fraternity. That meant developing a growing relationship with the Penguins. "Everything was black and gold. That's what's unique about Pittsburgh. All the colors are the same," Cowher said. "I think the Penguins have been a big part of bringing pride to the sports scene. The Steelers have had success, but so have the Penguins." When Cowher retired from the Steelers after the 2006 season and moved to Raleigh, N.C., the following year, there was a familiar face waiting for him -- Ron Francis, the Hockey Hall of Famer whom he befriended in Pittsburgh, had retired and become the Hurricanes' director of player development. In addition, many of Cowher's neighbors and friends happened to be hockey players. "I moved and was next door to [Eric ] Staal and [Matt] Cullen, so I got to know a lot of the players," Cowher said. "Then I got involved when they were playing the Penguins. Everyone thought I switched alliances, but I was living down there at the time." It was "getting involved" that momentarily got Cowher in trouble with the Pittsburgh faithful. Before Game 4 of the 2009 Eastern Conference Finals between the Penguins and Hurricanes, Cowher sounded the ceremonial pregame siren at PNC Arena. The gesture allowed him to get closer to the sport he had grown to love -- but it didn't come without some criticism. "I got a lot of flack when I did that, as you would think," Cowher said. "There was no losing in that situation. I'm a big fan of the game." It's hardly surprising that someone who always seems to cross paths with hockey players now includes an NHL player among his immediate family. His daughter, Meaghan, met Kings forward Kevin Westgarth when both were students at Princeton University; they were married last year. For Cowher, who attended L.A.'s Game 3 win against St. Louis in L.A., the Kings' lengthy playoff run has given him even more opportunity to enjoy the sport that seems to have followed him all his life. "I enjoy watching the playoffs. 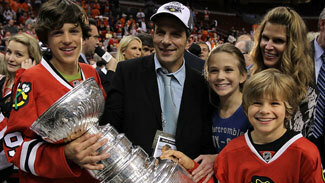 I think playoff hockey has definitely gone to another level," Cowher said. "I just have a great respect for the game. Every night, you see someone step forward."